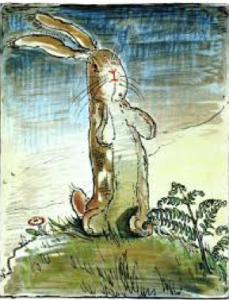 The Velveteen Rabbit, a children’s book written by Margery Williams, is a story about a stuffed rabbit sewn from velveteen that is given as a Christmas present to a small boy. The boy plays with his other new presents that are modern and mechanical and forgets about the old fashion Velveteen Rabbit that sits forgotten in the corner. Then, the wisest and oldest toy in the nursery, the Skin Horse, who was owned by the boy's uncle, tells the rabbit about toys magically becoming real due to love from children. One night, the boy's Nana gives the rabbit to the boy to sleep with, in place of a lost toy. The rabbit becomes the boy's favorite toy, enjoying picnics with him in the spring, sitting with him at the table, and the boy regards the rabbit as "REAL." There’s a lot that is REAL about Windekind. Its buildings are eclectic and of different ages, they have been built, fussed with, and fitted again and again to meet the needs and expression of ourselves and all the hundreds of others who have visited the farm. Canopies of mature trees have grown to offer shade and scale; meadows have been cleared, mowed, and planted; perennial flowers have grown and the gardens taken form and shape, and then, again and again, take form anew. Relationships that have developed from years of shared experience, deepen and expand. There is a history here. The patina of time creates a rich tapestry of memory about people and place that is irreplaceable. But like old clothes and old toys, a place and the people who live in them can get frayed and worn. They may not fit the way they used to or have the brightness of this year’s fashion and latest technology. So it’s tempting to leave all this behind and go elsewhere and build something anew from scratch. But, like the Velveteen Rabbit, the farm and its history has become very real and therefore very loved. Loving this mountainside place means that we are unwilling to go elsewhere. To do this, we seek to create a transition to a participatory community—one with shared democratic values. combined with an ecology that respects the land. Our mission is to create an environment where a diverse and multi age group of families feel a sense of belonging and interconnection with others and their environment—a place that is aesthetically uplifting, culturally rich, and environmentally and economically sustainable--a place that insurers, in its goverance, that the best interest of the individual is achieved when the best interest of the community as a whole is realized. Strive for diversity of age, background, culture, gender, race, skills and life experience within a frame work of common values and vision about community and the environment. Striving for diversity means attention is given to funding mechanisms, pricing and seeking grant for making the community as affordable as possible for families and individuals who have less capital resources. Add value and beauty to the land through environmentally sensitive additions of gardens, orchards, ponds, rain gardens, wetlands, stonework, paths, trails, roads, public spaces, grazing areas and well managed woodland. Establish a legal structure for the Commons that ensures legal integrity, wise use, and effective values-driven operations.